why use a dog harness? Pulling on a collar can be harmful to a small dog as it may damage the trachea and make it difficult to breathe. A harness protects the delicate structure of your little dog's throat by distributing forces throughout his ribcage. Our story is like many of our customers: After searching far and wide through the small dog market, we found nothing suitable for our Yorkie, Tiffany. We must confess that we are demanding consumers - only the best will do for our Tiffy!. So we decided to design our own. 1. Trachea safe: First and foremost, it protects your dog's throat, with plenty of room for her head and neck. 2. Simple and easy to put on: It's very easy to figure out and goes on in seconds. Because when it's time to go, it's time to go! 3. Smooth and free of sharp edges: Nothing to scratch sensitive skin or mat the coat. 4. Allow complete freedom of movement: It leaves your dog's front legs free, without restricting movement in any way. 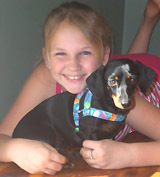 We call our harness the Easy On Dog Harness because there are two simple steps to putting it on. First, over the head. Then fasten the side-release buckle. That's it! 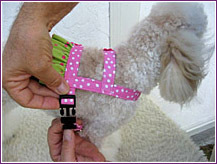 To remove the harness, simply unfasten the buckle and slip it back over the head. There's plenty of room for your dog's head and neck. The Easy On Harness allows complete freedom of movement for his legs. 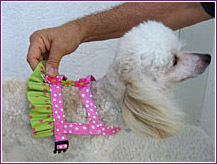 And unlike a step-in harness, there is no need to pull those delicate front legs through straps or leg openings. You have only one adjustment to make -- the strap that goes around your dog's ribcage. The harness is adjusted correctly if you can slide your finger easily between the adjustable harness strap and your dog's body. "I've spent more than 6 months trying to find a harness that works for my little guy ... all great products but nothing fit him correctly. Everything from usual nylon gear at the local pet supply stores to the special training harnesses ... just didn't quite fit. To eliminate the need for other adjustments, we make 9 sizes instead of just 4. Each size is proportioned to fit the chest and neck area for dogs within a 3-4 inch girth range, and also within a 3-4 pound weight range. The sizes overlap a bit, and we recommend choosing the smallest size that fits your dog. We think you'll appreciate the convenience of fewer adjustments, and your dog will appreciate the comfort of a great-fitting harness. See our Harness Sizing Guidelines to find the right size Easy-On Harness for your dog. "Madison has the Visor, Harness, Adjustable Leash and the Dooty Duffel. The harnesss is so easy to put on (she is a wiggle worm) and we luv the easy access to the dooty duffel. Another Happy Pet ... and very well dressed as well." - C.B. "Just received my teacup harness for my 9 week, 2.5 pound chihuahua and it is awesome! Very easy to put on just like your website says and he seems very comfortable wearing it. Could not be more pleased. Thank you and I will be back to order another when he gets ready for the next size." - D.
"Just a note to say these are the most perfect fitting harnesses I've ever found for my Maltese. And so easy to get her into them. Thanks so much for such a well-designed and quality-made product!" We proudly offer UDogU's "Easy On" Dog Harness, handmade in the U.S.A. by the skilled craftspeople at UDogU. Our harnesses, leashes, hats, collars, and other accessories are all available in the same matching fabrics, for a complete high-fashion ensemble.